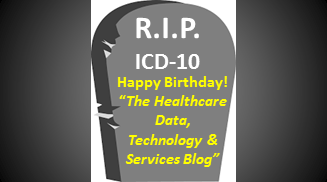 The Healthcare Data, Technology & Services Blog: R.I.P: ICD-10 - Happy Birthday "The Healthcare Data, Technology & Services Blog"
R.I.P: ICD-10 - Happy Birthday "The Healthcare Data, Technology & Services Blog"
Well, maybe whoever sent that request was correct – at the time at least. After the first year of blogging I wrote a post “5 Things I Learned in My First Year of Blogging.” What I learned about blogging was that I had to stick with it, that it’s actually way easier than I thought – if I do it in small bits and pieces and use available tools. I also realized that I blog to help me focus myself; blogging is a means of relaxing and clarifying my thoughts. Since I started the blog, I’ve made over 180 posts, or roughly four posts a month. I’ve had over 200,000 unique visits on my site. And I’ve been included on many “Top 50,” “Top 100,” and “Best Healthcare IT” blog lists for the last few years. I’m consistently ranked very high by Google on the topic of ICD-10 – and I don’t do any SEO – at least that I’m aware of. A couple years ago my role on the ICD-10 project was completed. Since then I’ve been working on a number of very interesting and, in my opinion, leading edge technology-based projects in the healthcare realm. Since ICD-10 finally went live this past October, it’s time for me to move on. Accordingly, I’ve renamed my blog as “The Healthcare Data, Technology & Services Blog” to reflect the general health care IT-based topics I write about. · What is your current biggest challenge? · What is your greatest risk? · What are the key questions you as a provider have for a payer? and vice-versa? · What specific areas of the assessment or remediation process would you like more information about? Respond here or send me an email at shimcode@gmail.com. I will do my best to respond and/or blog about all requests. I will do my best to respond to all requests.